Used on water garden skimmers for years before the invention of the Hudson Waterfill Valve. If you have room in your skimmer box, this is an economical way to add water to your pond automatically. Whether your pond's water level drops from evaporation or a small unfound leak, an automatic waterfill valve will keep the water level topped off automatically. This will save you time and agravation over having to worry about having to add or not to add water each day. Fittings for connecting to ½ Poly Pipe. NOTE: For customers who own the old style Aquascape Float Assembly (1995 - 2007), we have been asked if the float can be sold separately. The answer is: no it can not. We purchase these kits complete from the manufacturer and can not break up a kit. These new updated kits should last longer than the previous models which some had a problem with the floats breaking when banged against with force. Drill a ½" hole in the rear of your skimmer box above the water line. Install the Waterfill Valve with the rubber washer against the inside of the skimmer box so the threads protrude out the back. Attach washer & nut to threaded end and secure against the outer rear wall of the skimmer. Attach fittings for ½" pipe and then install the ½" Poly Pipe to the fitting. Attach ½" Ploy Pipe to hose spigot. Fill your pond's water level to the recommended height. Next, loosen the screw(s) on the float rod where it attaches to the Waterfill Valve. Turn the hose spigot on so water flows from the waterfill valve. Adjust the level of the float so the water just stops flowing. Tighten the screw(s). You are now complete. As the pond's water level drops, the float will lower allowing the waterfill's internal valve to open and replensh the lost water in the pond. It will automatically shut off when it reaches the desired shut off hieight you selected earlier. You can gently bend the float rod to make any fine tune adjustments as necessary. 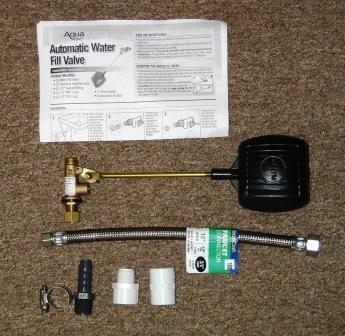 It is the same valve that is in many toilet water tanks and works the same way. To view the written Waterfill Valve Instruction Manual (English & French) in a Down-loadable PDF file that can be printed, click on the link at the end of this statement. When you are finished with the PDF file , click your browser's BACK arrow (located in the upper left corner of your screen) to return to this page. "DOWNLOAD MANUAL"
3/24/2009 – Can this float be submirged and still work. Can it be overfilled by water I want to use it in a tank that will back fill . . .